To confess your faults does not mean to tell every detail of how you missed God to everyone you come in contact with; but rather, it simply means to admit to God and fellow believers that you need the grace of God to help you. Doing this opens the door for them to agree with you in prayer so that you may be healed. One of the results of having unconfessed sin is sickness. That is not to say that everyone who is sick has unconfessed sinned. When most people think of sickness they think of bodily sickness. But, you can have a sick bank account, a sick job or career, a sick (broken) heart, sick thinking (void of the mind of Christ), or … Sickness can show up in any form and anywhere in your life. Confession is the first step in committing to living right in the sight of God. God is Jehovah Rapha, the LORD that heals and healing belongs to His children. 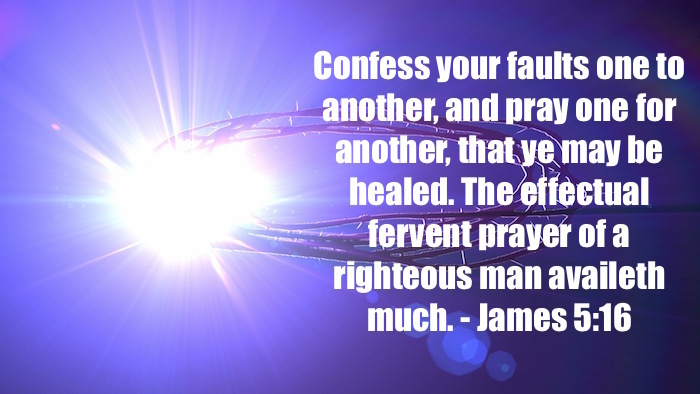 Confessing your sins places you in right standing with God and makes your prayers effective. Seek him today for your healing in every area of your life. Prayer for today: Father, I decree and declare by your word that I am “the healed” and I walk in divine health every day in every area of my life. In JESUS name, AMEN.